I've spent the last four days hanging out with my parents, who were visiting from Minnesota. We drank wine, strolled down quaint small town streets, ate delicious food, and explored San Francisco on foot. We also visited Alcatraz at my parents' request, which is not something I would normally do. It turned out to be really fun! On a foggy April morning, the island looked especially green and mysterious. 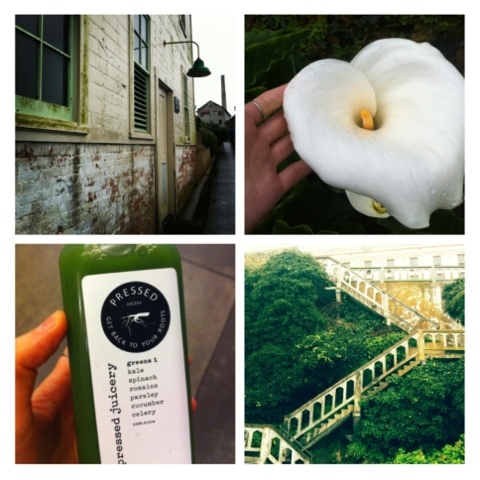 Clockwise from top left: a mossy wall (Alcatraz), an enormous calla lily (Alcatraz), a beautiful weather-worn staircase (Alcatraz), and green juice from Pressed Juicery (Ferry Building). Great pics! I only saw Alcatraz from far; wish I could have seen it up close like you.